Starting a tube-acrylic painting on canvas covered board. 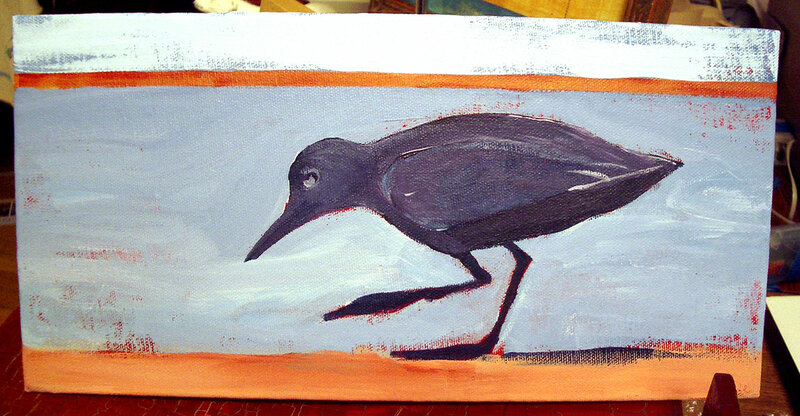 If you look closely you can see a pencil sketch where my shorebird is going to appear. When painting with acrylics I like to use various colors for the first layer which will then peek out later in the process. 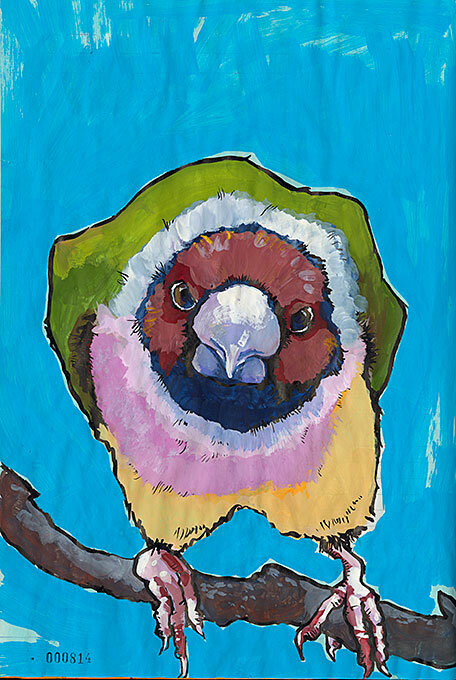 This is a painting from a bird series I made in 2007. I’ve used current acrylic work already on the blog so I decided to show you this step by step series of photos I saved from this project while I discuss acrylic painting. The sketches made for this are in a 2002 journal that is archived. I made a series of sketches at a zoo with a water “feature” and combine them into a stance and portrait I wanted. Then I resketched the basic shape onto the board. In December 2018 I wrote a post on how to deal with an artistic plateau. I included some book recommendations in the hopes that readers would use some of the books as workbooks for self-study, to work themselves off the plateau they found themselves on. I added pen and ink as well as drawing books to the list. If you use the search engine or category list of this blog to look at book reviews you’ll find tons of other review posts that cover books and DVDs on portraiture as well as individual how-to-books from artists whose work I enjoy. A long-time reader of the blog wrote in and asked about acrylic painting books. It was something she was just getting into and she didn’t remember if I’d posted about them. I thought I’d share my suggestions with you. Ten years ago I wrote about Patti Brady’s Rethinking Acrylic: Radical Solutions for Explaining the World’s Most Versatile Medium. That link will take you to the review. As I mention in the review, I don’t do a lot of work in acrylic. Back in 2007 through 2012 I was doing some acrylics for shows because it was easier to paint in acrylic on canvas or board, and not frame with glass. (Easier also to transport or ship.) I love experimenting so I was drawn to books like Brady’s. Here I have built up the background and the body of the bird. (I don’t use black paint so my darks will be built up using complementary colors. The board is sitting on a paper towel to protect my drawing board. I now have a table easel to hold small acrylic paintings while I work. The reader asking me about acrylic painting books was interested in portraiture specifically, so my recommendations are skewed in that direction. First, recent Drawing Practice students alerted me to “How to Paint Fast, Loose and Bold” by Patty Mollica. I took a look at the book and thought it was quite good, but I don’t recall if it’s about oils only. Everything in it can be done with acrylics though. She has a bold fresh style with un-muddied colors that would lend itself to striking and bold portraiture. Mollica has another book I’ve not seen, called Modern Acrylics. That might be worth a look at the library. Carol Marine’s Daily Painting is about oil painting (her medium) but it applies to other medium as well and I thought it was a charming and interesting book, but it isn’t about acrylics. Scrolling through Google I found Acrylic Revolution by Nancy Reyner. I don’t know if she’s connected to Golden but I remembered reading and enjoying this book. The book contains abstract treatments, but it’s really about understanding how the paint works and then you can use it however you like. She has another book Acrylic Illuminations. I’ve not seen that in person. Her work is abstract and about using the different products, and when I read it knowing the different products was what was important to me because my acrylic work often has lots of underlying textures upon which I paint realistically. Here’s a dog portrait I did with realistic painting over dimensional bits. Books like Brady’s help you understand the paint so you can do what you want with it. For me acrylic is about that type of texture I can’t get in my watercolors, or even in my gouache paintings, so the books I’ve looked at tend to be about acrylics used almost like oil paints with thick dimensional strokes. Since the reader who originally asked me for acrylic book recommendations wrote back saying she painted from imagination I recommended that she look in any of the Fantasy and Science Fiction annuals. Spectrum is one. A lot of the included artists are also working from imagination (I hope!) and many worked in acrylics for years before they went digital. So you might find some of the practitioners who’ve been at it for awhile who still work in acrylics. And many of them have books on painting written when they were in their acrylic phase. If you Google “Fantasy artists working with acrylics,” you’ll find kick starters for teaching DVDs as well as videos on YouTube. If you like the artist’s work it’s worth it to spend 20 minutes watching a video to see if it’s worth investigating their work more. Acrylics must be one of the most popular paints on offer right now. They are easier to clean up than oil paints, and they have a wonderful range from transparent applications to opaque usage. This allows one artist to use the paints in a variety of ways. 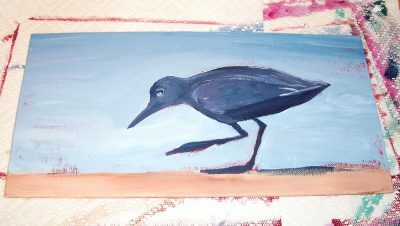 I have continued to work on the build up of the bird and have started to section off the background. I tried an almost white light blue at the very top and found it didn’t read the way I’d intended, so I rethought and the central water area became lavender, and the distant sky will become light blue as you’ll see in the finished piece. The best way to take advantage of these characteristics of acrylic is to invest some time into how they are made and how they work. There’s that constantly stated rule that you can’t thin acrylics more than 50/50 with water or your paint film won’t adhere to your substrate. But what some people leave out is that when you work on paper, which is absorbent, this doesn’t apply. You can thin with a higher percentage of water. If you’re working on paper directly you can thin with a higher percentage of water—and that’s good because most of additives and so forth smell too much for me (more about this later). Keep this in mind when you are working, however—if you are working on a surface that was treated with gesso or another acrylic medium you do have to adhere (pun intended) to the 50/50 percent rule. How do I know these things? I attend all those manufacturer talks companies are always giving and I ask a lot of questions. If something I’ve read seems silly or without purpose to me I always ask about it. I encourage you to start attending these events yourself. Also take advantage of the internet and watch a the videos a paint company puts out explaining their paint. They want you to understand their product because they want you to buy more of it. Golden does a lot to educate the artists using Golden paints. They have videos on how to use their different products. Take a look at any of them? Even if you’ve been painting for a long time have a look. You might have forgotten that the paint you’re using has certain capabilities because you didn’t use them in the way you used to paint, but now you’re painting in a way that could make use of those capabilities! Just knowing what the different products would do would allow you to do whatever you want to do with them. You might want to write to Golden and ask which of their instructors have books out. They have a contact email on their Certified Working Artist Program page. Repeat with any other paint brand you’re interested in. What Brands of Acrylic Paint Do I Use? I started in acrylics with a brand that Stephen Quiller was advertising, but I don’t see it available anywhere. So gradually I changed over to Golden Acrylics, which is universally available in the US. This is the completed painting, 6 x 12 inches. It has the advantage of having less odor than many of the other brands. I’ve also used Daniel Smith and the odor is not overwhelming. I avoid any “open” acrylics. They have a longer open time by virtue of added ammonia, and that simply knocks me out in about thirty seconds, even if the windows are open. I tend to use tube paints and also fluid acrylics. 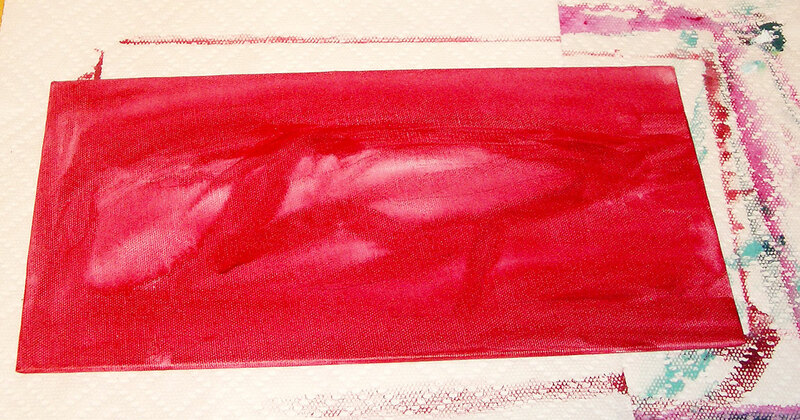 When I work with tube paints I use a Masterson Sta-Wet Palette. When I work with fluid acrylics I have various disposable palettes and plates I put the paint on. I use fluid acrylics when I want to tint any medium because fluid acrylics have the highest pigment load of all the types (tubes, jars, fluid) of acrylic paint. That means if I put a red fluid acrylic in any dimensional acrylic medium for instance it will seem less diluted than if I use the tube paint, which already contains lot of medium. My aspirational brand is Lascaux acrylic in tubes. It had low odor the last time I checked (about 7 years ago), and it worked beautifully during the in-store test I was allowed to make with a couple paints. It’s an aspirational brand because it is more expensive, but also because I had just purchased a lot of Daniel Smith and Golden Acrylics and couldn’t justify switching. Over time I’ll replace tubes with the Lascaux. Theoretically you can use any of your watercolor brushes for acrylic painting. I tend to keep my brushes separate by paint type. This means I don’t use my expensive sables for my acrylic paintings. I would recommend that you didn’t either. If you delay the cleaning of a brush containing acrylic paint the paint dries in the brush and ruins it. Detail from the painting. For me acrylic painting is a chance to step away from detail and look at shape, value, and texture in a looser way than how I typically made watercolors. I love all the loose edges, like these around the feet, which you can have quickly and easily with acrylic paint. And you can still see through to the red first layer, which gives a shimmer to the original. Instead I recommend that you purchase some good quality synthetic brushes which have the body and feel that you like. For me, I enjoy stiffer brushes when working in acrylics because the point is usually to work with dimensional strokes. You can read about the brushes I like to use here. While the post listing my favorite brush types and brands is almost 10 years old you can still find the majority of these brushes, I still use them, and they provide you with a sense for the type of brush I use for a given task, so that you can find a substitute. The Silver Bristlons are my favorite for acrylic tube paint. I find their filberts to be fantastic. I also encourage you to go to your local art supply store and see what’s new. In the past two years alone several companies have released new flats that are longer and range from stiff to supple. There is a lot for you to explore depending on how you like your brushes to push back. But you really do need to buy a couple and try them for yourself. When working in acrylic paint I also like to use Claybord’s Texturebord™. This is a portrait of Lucky, a friend’s beagle who came to visit years ago. 9 x 12 inches. I loved her walleyed stare. I’ve already mentioned that when painting on untreated paper you don’t need to worry about using water to thin your acrylic paints beyond the 50/50 ratio. I do a lot of painting on paper because of that. But one of my favorite things to do with acrylic is to paint on canvas or canvas boards because the texture of the canvas comes up into your painting if you want it to. Also I find that if I use canvas boards the board supports the entire canvas surface so I can push hard into the painting and the board pushes back. This is important to me and the way I work with my strokes. The hardest thing I’ve ever done is a 5 foot tall painting of a goose on a pre-stretched canvas. The entire surface was unsupported except at the edges. I had to devise a support to insert behind and into the canvas back to support it. Otherwise I’d still be painting that painting! It’s a matter of what you like. I’m going to end with the best tip I was ever given for acrylic painting. We’ve all seen acrylics that are muted and dull. It isn’t that they have a Satin or Matte varnish on the surface, they just look cloudy. What’s happened? Years ago an acrylics expert explained this to me once—the matte acrylic medium that so many people use to mix and thin their acrylics with (to avoid breaking that 50/50 rule when working on boards and canvas) contains matting agents meant to stop the acrylic medium from looking glossy and shiny, or as some people say—looking like plastic. Every time people mix their paints with matte medium they are adding more and more of this “clouding” effect to their paintings. The result is flat, low contrast, paintings which lose their brilliancy. This is very evident in a lot of collage work that has been put together with layer after layer of matte medium. To avoid this in your paintings use glossy medium in your mixes throughout your painting process. At the end of your painting process chose the medium or varnish that will give you the finish you want. So if you want a glossy finish end with that. Want a satin finish? Put on a coat of that at the end. Want your painting to be matte? Use a matte medium or varnish at the end. What’s Your Favorite Book on Acrylic Painting Techniques? If you have a favorite book on Acrylic Painting Techniques please leave the author, title, and a brief description in the comments section below. It might be just the book that another reader is looking for. Make sure to mention if it deals with abstract or representational work because some artists only want to look at the type of work they are engaged in, so that will avoid surprises. Roz, you mention that your reference to thinning more than 50/50 on paper does not apply to paper treated with gesso and other substances. What about sized watercolour paper, particularly types that are more heavily sized? I’m not quite sure I’m understanding your question. In my post I mention that the 50/50 dilution of acrylics with water doesn’t apply to painting on paper. By that I mean that paper absorbs the acrylic in a way that even when diluting the acrylic more it still absorbs into the paper. This will include watercolor paper that is factory sized for watercolor. No problems. 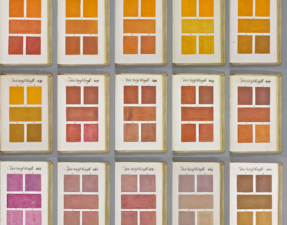 Watercolor sizes placed on commercially made watercolor papers are water-soluble in that they are disturbed by the water and paint you apply to them and they don’t stop the absorption of the paint into the paper. Watercolor size basically helps the watercolor pigments float on the surface of the paper rather than get sucked in like a blotter would. But there is still absorption. Even in heavily sized watercolor papers. If you put gesso on a paper you’ve essentially turned it into something that is no longer absorbent in the same way the paper was. 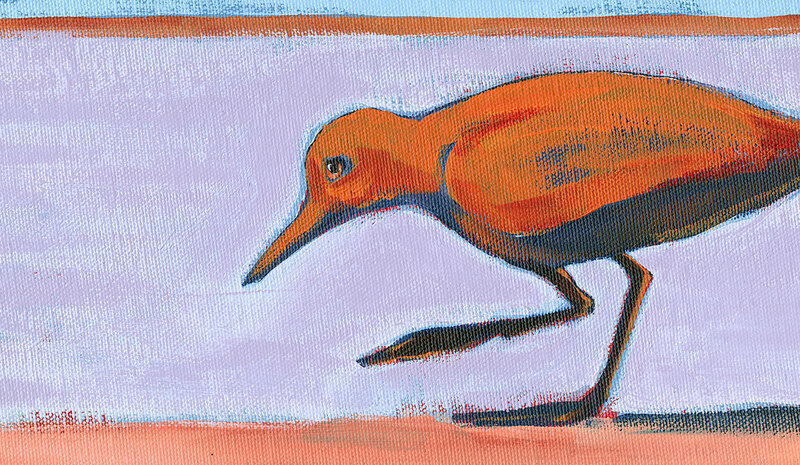 The gesso used by most people these days is acrylic based, and this creates a barrier on the gessoed paper. The paint applied to any gessoed surface is now not responding to the paper, but is responding to the gesso surface, which is acrylic—a more paint to water ratio is needed then for adherence on a gessoed surface even if that surface is paper. In a separate matter, Watercolor ground is something also to think about because it has an acrylic base, yet it is made to be absorbent like paper. I don’t use it with acrylic paints so I haven’t inquired into any issues that might arise if you cover a paper with watercolor ground and then use acrylic paints on top of that. I suspect the watercolor ground, because of how it functions with the watercolor it’s made to work with would absorb acrylic paint sufficiently but you might want to contact the manufacturer of such products if you intend to use them with acrylic paints. If you paint on paper that has been gessoed you will need to follow the 50/50 guidelines to ensure that your paint adheres with the gessoed paper. I hope I’m understanding your question and have clarified this for you. Thanks very much, Roz. That is what I was asking. I thought watercolour papers would be OK, but I wasn’t sure. 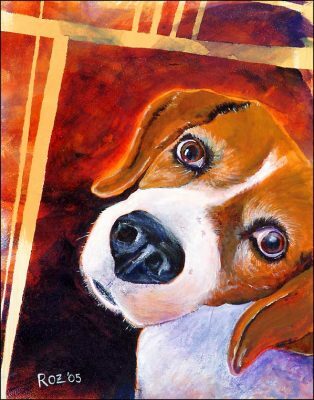 Your painting of Lucky is fabulous and makes me miss my sweet Annie. Roz, a question about the use of mediums. I recently started working in mixed media, incorporating hand painted collage papers into my acrylic paintings. I have been using matte medium to affix these papers, but I’m now concerned about what you said about matte medium dulling the colors. 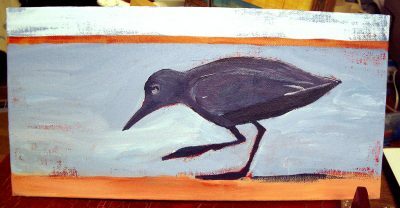 You suggest using gloss mediums in mixes throughout the painting process. But what about when using medium as an adhesive for collage papers? Do you suggest using strictly gloss medium for this purpose? I prefer a matte finish for my artwork, so I always use a matte or satin varnish, but I don’t want to lose any of the vibrancy of the colors in my collage work before I get to the final finish. As always, thank you for the wealth of detailed and useful information you so generously provide through your blog and online classes. I have benefitted greatly from it. excuse the short note, I’m not in the office at present. Yes to GLOSS medium for all layers. You could use a Gloss Gel medium if you think you need body for adherence. If you use matte all the issues I mention re: murkiness apply. See this post too https://rozwoundup.com/2010/07/glue-and-the-xyron-machine-sticking-things-into-your-journal.html. I’ve had no problems getting adherence with gloss Gel medium on my large wall pieces like this https://www.rozworks.com/art0511.html. Just apply to back of item to be glued, place, put wax paper on top, burnish down, weight until dry. Continue with project. Alternately if you like to apply gel medium to both sides and therefore can’t burnish down and weight it that’s fine, I just don’t work that way. Thanks so much for the clarification, Roz. I will give the gloss medium a try.